Reading and share top 12 famous quotes and sayings about Counsellor by famous authors and people. Browse top 12 famous quotes and sayings about Counsellor by most favorite authors. 1. "I had an uneventful few days," it told her. "The most exciting thing was an hour-long lecture from the headmaster on taking our studies seriously. He said next year's exam will arrive sooner than we think. ""No, they won't," Valkyrie said, frowning. "They'll arrive next year, exactly when we expect them. ""That's what I told him," the reflection nodded. "I don't think he's comfortable with logic, because he didn't look happy. He sent me to the Career Guidance counsellor, who asked me what I wanted to do after college. "Valkyrie stowed her black clothes. "What did you say? ""I told her I wanted to be a Career Guidance counsellor. She started crying, then accused me of mocking her. I told her if she wasn't happy in her job then she should look at other options, then pointed out that I was already doing her job better than she was. She gave me detention." 2. "Not unnaturally, many elevators imbued with intelligence and precognition became terribly frustrated with the mindless business of going up and down, up and down, experimented briefly with the notion of going sideways, as a sort of existential protest, demanded participation in the decision-making process and finally took to squatting in basements sulking.An impoverished hitch-hiker visiting any planets in the Sirius star system these days can pick up easy money working as a counsellor for neurotic elevators." 3. "Where there are many counsellors there is safety." 4. 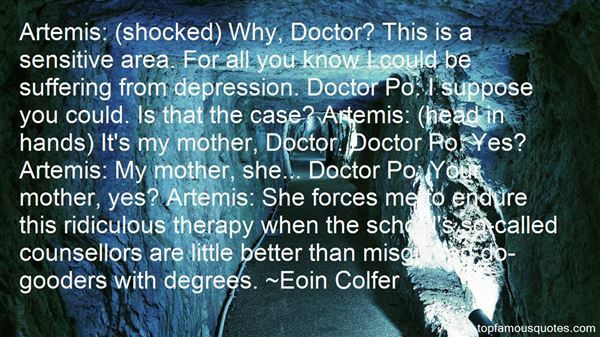 "Artemis: (shocked) Why, Doctor? This is a sensitive area. For all you know I could be suffering from depression. Doctor Po: I suppose you could. Is that the case? Artemis: (head in hands) It's my mother, Doctor. Doctor Po: Yes? Artemis: My mother, she... Doctor Po: Your mother, yes? Artemis: She forces me to endure this ridiculous therapy when the school's so-called counsellors are little better than misguided do-gooders with degrees." 5. 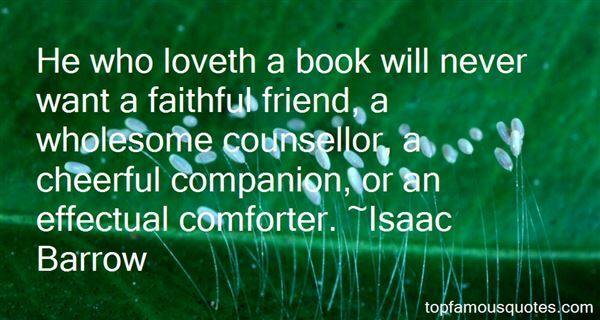 "He who loveth a book will never want a faithful friend, a wholesome counsellor, a cheerful companion, or an effectual comforter." 6. "Elinor, this eldest daughter, whose advice was so effectual, possessed a strength of understanding, and coolness of judgment, which qualified her, though only nineteen, to be the counsellor of her mother, and enabled her frequently to counteract, to the advantage of them all, that eagerness of mind in Mrs. Dashwood which must generally have led to imprudence. She had an excellent heart;—her disposition was affectionate, and her feelings were strong; but she knew how to govern them: it was a knowledge which her mother had yet to learn; and which one of her sisters had resolved never to be taught." 7. 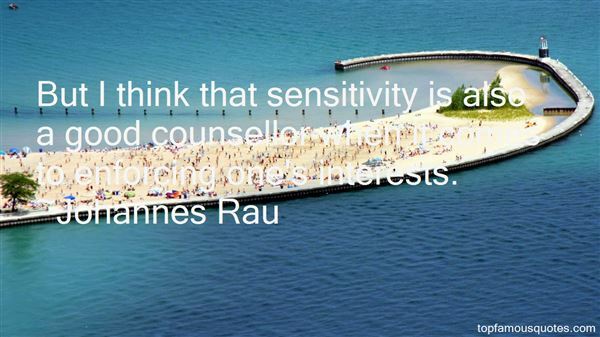 "But I think that sensitivity is also a good counsellor when it comes to enforcing one's interests." 8. "I have ever hated all nations, professions, and communities, and all my love is toward individuals: for instance, I hate the tribe of lawyers, but I love Counsellor Such-a-one, and Judge Such-a-one: so with physicians—I will not speak of my own trade—soldiers, English, Scotch, French, and the rest. But principally I hate and detest that animal called man, although I heartily love John, Peter, Thomas, and so forth. This is the system upon which I have governed myself many years, but do not tell..."
9. "And now dear little children, who may this story read, To idle, silly flattering words, I pray you ne'er give heed: Unto an evil counsellor, close heart and ear and eye, And take a lesson from this tale, of the Spider and the Fly." 10. "I am by birth a Genevese, and my family is one of the most distinguished of that republic. My ancestors had been for many years counsellors and syndics, and my father had filled several public situations with honour and reputation. He was respected by all who knew him for his integrity and indefatigable attention to public business. He passed his younger days perpetually occupied by the affairs of his country; a variety of circumstances had prevented his marrying early, nor was it until the decline of life that he became a husband and the father of a family." 11. "Every king needs a counsellor, a counsellor who is never afraid of the king." 12. "The astonishment soon passed off, the scales seemed to drop from his eyes, and the book became at once and for ever to him the great human and divine book, and the men and women, whom he had looked upon as something quite different from himself, became his friends and counsellors."